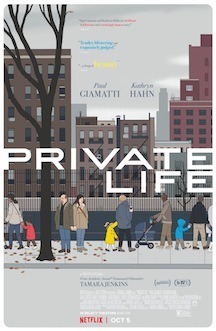 I struggled with mixed feelings after watching Private Life, Tamara Jenkins’ third feature (Slums of Beverly Hills; The Savages) about a middle-aged married couple in a desperate quest for a child. When regular fertility treatments don’t seem to be a solution for their problem, Richard (Paul Giamatti), 47, and owner of a theater company, and Rachel Grimes (Kathryn Hahn), a respected playwright, turn their focus to one last possible solution before going for adoption: In Vitro Fertilization. After the initial reluctance, the procedure becomes a vital factor to refine the meaning of their marriage and goal as a family, but for this, they need an egg donor. As a consequence of frustrating online scams, their choice couldn’t fall on someone more problematic than Sadie (Kayli Carter), their young niece who is going through an emotional crisis. How will her parents, Cynthia (Molly Shannon) and Charlie (John Carroll Lynch), react to the idea? Even granting that the smart script was matched by assuring performances, the repetition of the idea and static tone made me moderately disinterested as I got more and more disentangled from the characters’ obsession. There’s a vein of seriousness and poignancy, which Jenkins attempts to balance with awkwardly comedic moves. She also portrays the characters’ complexities with no exaggeration and that becomes the reason why the film wobbles but doesn’t disintegrate.